Last week the Washington Post Company declared that it could no longer handle the losses of the 77 year-old Newsweek magazine and announced that it was seeking a buyer. This comes as no shock to those who are closely involved in the industry. Print media in general is under siege by competition from the Internet and there is no bottom in sight. The impact of the Age of Omni Communication is being felt by all the traditional media, including guaranteed circulation magazines like Rotary International’s The Rotarian magazine. For most of the 20th century the traditional media sources of newspapers, magazines, radio and television had settled into their respective niches. It was a balance that allowed all of the traditional media to control their share of the advertising revenue. Print media has been accustomed to measuring success based on circulation, which means they offer numbers to advertisers that measure output, but don’t really measure effectiveness. Traditional media uses the broadcast (one-way) communication model which tends to overlook the questions of whether expensive print media ads are: 1) actually noticed by a reader, and if noticed, 2) do the ads increase sales? The analogy that print media has lived by: if you throw enough goo at a wall something will stick. It was a model of business that worked because there was no better alternative. No one had any reason to believe it would ever change. Newspapers were the first to feel the effects of the Internet. By the new millennium people were bypassing them and linking directly to news websites. Soon circulation dropped, and once circulation dropped then advertising revenue dropped. Next to go was the newspaper’s major money-maker; classified advertising. It was swept away almost overnight with the appearance of websites like Craig’s List. By 2003, newspaper revenue began a free-fall and hardest hit were investor owned newspaper groups that could not afford to lose money because they were already being trimmed to the bone in order to harvest higher dividends. Magazines didn’t really see a major impact until blogs and Social Media tools like Facebook and Twitter began to dominate the world of information and communication. People began to speak for themselves and listen to raw information from sources that weren’t filtered through a small group of editors. The magazine staff saw this as heresy. How dare the public read stories that they haven’t approved! They believed that the role of the publishing world was to decide what the public should know and the Internet was full of information that they hadn’t approved. Comfortable in their arrogance, magazine publishers thought they would survive where newspapers failed, but in 2007, popular magazines like Time and Newsweek had the floor drop out from under them. Advertisers had discovered that people were basing purchasing decisions on what other people were saying about the products/services in the Social Media. Mass advertising was losing the battle to customer reviews and person-to-person online interactions. For the first time magazines had a competing alternative that exposed the fallacy of mass advertising. Highly specialized magazines and membership magazines have been insulated from the fate of the rest of the print media world, but it really is a matter of time until all print media see the reality of Social Media. The official magazine of Rotary is no different and the first sign of change happened two weeks ago. During the last week in April, Rotary International convened the 2010 Council on Legislation. This is a body of senior administrative Rotarians (all past District Governors) that review and approve changes to Rotary International policies. Among the over 200 proposed changes was a request to allow the internal Rotary magazine to be offered in an electronic format option and allow members to cancel the delivered hard copy magazine. No big deal, right? But it is a big deal. The Rotarian Magazine is a monthly magazine with a guaranteed circulation. Every member of Rotary is required to receive it. That allows Rotary International (RI) to reach every member once a month, but it also allows RI to guarantee circulation to advertisers. No one really knows what percentage of Rotary members actually read the magazine, but in the world of advertising it is circulation that counts and it seems certain people at the 2010 Council on Legislation knew an electronic version could drastically reduce the circulation of hard copy of The Rotarian. An electronic option is a bigger issue than just circulation numbers. This issue of electronic versus print is an example of the bigger conflict between traditional print media and Internet media. Beyond advertising revenue this is an issue of format and content. 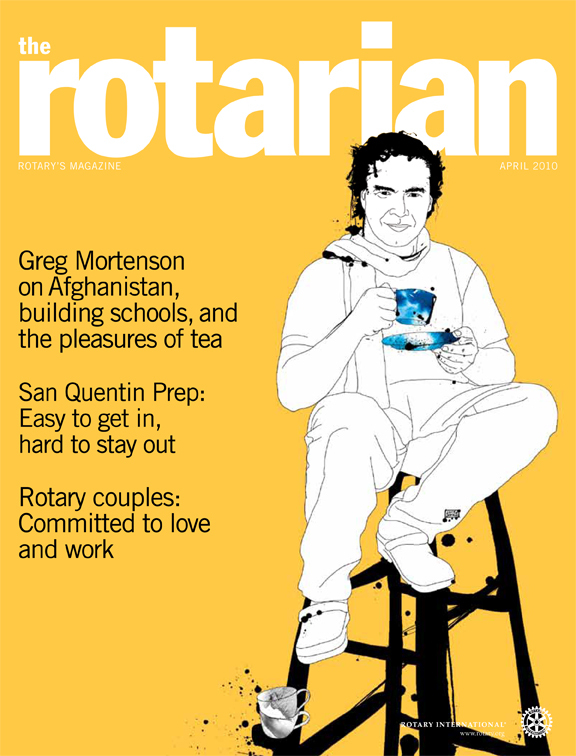 Currently, The Rotarian is a 64 or 80 page magazine (80 pages when there is a multiple page supplement). The first 30 or so pages are a mix of departments and Rotary and non-Rotary advertisements. At about page 30 the magazine starts three or four ad-free feature articles for the next 21 to 26 pages. The remainder of the magazine is small item articles, classified ads, and mostly Rotary related ads. This is a format that works for print media. The two significant characteristics of The Rotarian print version that conflict with most models of electronic media are: 1) ads intermixed with the substance of the magazine and 2) long articles. In the most recent edition of The Rotarian (May 2010) there is one article that is 18 pages long. Internet-based reading has rejected advertising (called spam) and most information is delivered in three to five paragraphs (except, of course, my blogs which violate all the rules.) Blogs/articles that violate the rules are ignored. Therefore, to be read in an electronic format The Rotarian would have to eliminate the ads and severely trim the articles, which means a print version would either have to change or two different versions would have to be created. There are two other options. The first is to create a version that would work with the new iPad, but that would mean members would have to purchase an iPad. The second option is to not change the format for the Internet, which would mean that most people would not read it. In the final analysis, a magazine is based on traditional media concepts and they do not translate to the Internet format. Social Media is focused on connections between people and sharing of ideas. A print magazine is a broadcast of information where no one cares if anyone reads it as long as the circulation numbers are good. But advertisers are getting smarter and stingier about throwing money at broadcast media. The fact is that The Rotarian is living on borrowed time. Eventually, the reality that circulation doesn’t measure anything that is relevant will cause advertisers to focus their efforts (and money) on real connections with real people. Without outside ad revenue the cost to maintain a print publication will force RI to move away from broadcast media and seek better options. The best option will be for RI to create a series of mentored blogs that allow people to read and discuss the Rotary issues that are important to them. Rotary International is already experimenting with this through Social Media tools, but there is and will be resistance to giving up traditional media. Next year will be the centennial celebration of The Rotarian magazine. It may also be the celebration of the end of an era.